"I just wanted to say thank you for the treatment I received at Ennis Physical Therapy . Not only was the treatment highly effective, but John was patient, responsive and attentive. I would be delighted to highly recommend his services to anyone"
"Since beginning my treatment with the clinic I've seen a great improvement in my shoulders and back." 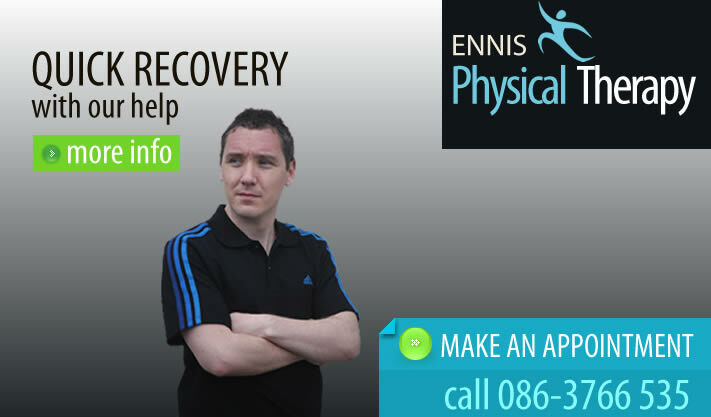 Based in Ennis, Co. Clare, Ennis Physical Therapy offers you a professional and hand's on approach to physical therapy. If physical therapy has been recommended for you or you just want to get that injury fixed once and for all, the choice is yours when it comes to where you receive treatment - and there’s no better choice than Ennis Physical Therapy. Let us work with you to develop a physical therapy plan that suits your schedule, your body’s capabilities and your goals. Together, we can help you achieve a healthy, happy life that is free from pain. Physical therapy is an holistic and patient-centred approach focusing on the manual treatment of the soft tissue - muscles, tendons, ligaments, and fascia. At Ennis Physical Therapy we use highly skilled, hands-on techniques to diagnose, prevent or treat underlying conditions and problems. Low back pain is a common musculoskeletal symptom that may be either acute or chronic. All sessions need to be pre-booked, and are by appointment only. We offer extended opening hours to suit your needs. If you require an appointment either before or after work, we will accommodate you.